Lucia visits schools and speaks with students throughout Austria about what she went through during the Holocaust. Lucia receives monthly payments from the Claims Conference Article 2 Fund in recognition of the persecution and suffering she endured. “On March 12, German troops marched into Austria. I was eight years old. As I reached the vicinity of Helden-Platz I couldn’t go any further – there were so many people on the Ring Road and on the side streets. And I stood there and heard the yells, the roaring, and this cry, “Heil, Heil, Heil…” and I knew that I didn’t belong there,” recalls Holocaust survivor Lucia Heilman about the Nazi Anschluss – annexation – of Austria in March 1938. In an instant, Lucia’s home country turned into a place of fear and uncertainty. Its 185,000 Jews suddenly faced hostility from those they had regarded as friends and fellow Austrians. Lucia told her life story to Centropa, an organization that documents Jewish life up to and through WWII and that receives Claims Conference funding for its work. “I found these cries and this atmosphere very threatening, immensely threatening. Then I left under the force of the threat I was sensing, and came home completely distraught,” Lucia said. 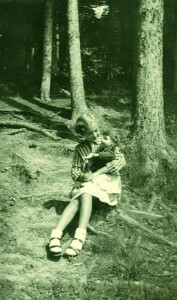 Lucia as a child with a friend. Lucia Treister was born in 1929 in Vienna to chemist Regina Treister and Siemens engineer Rudolf Kraus, who was not Jewish. Her father immigrated to Iran in the hopes of getting Lucia and her mother out of Austria, but he was too late. When the war broke out, he was considered a hostile enemy and was deported to Australia. Her grandfather was interned in a soccer stadium, with other men, and Lucia’s mother was told she could bring him some clothing. “We handed over the suitcase for Grandfather and shortly thereafter the people in the stadium were transported to the Buchenwald concentration camp. My mother – and even I – knew that the people would be murdered, and I would argue that all of Vienna knew, and even hoped, that those people being deported would never come back,” Lucia said. The family received a telegram that he died on October 23, 1939 in Buchenwald. Reinhold Duschka, Lucia’s father’s best friend, who owned a metal workshop, hid Lucia and her mother in his workshop for four and a half years. With barely enough to eat, the two lived in fear day in and day out. “He built for us a kind of shed, so that if someone came into the workshop – and various people did come: customers, the mailman, and deliverers – and if someone rang the door we crawled into the shed. The shed was made of wood and was like a very, very large and long box. We had mattresses and blankets and could sleep there. No one suspected that people were hiding in there. When someone was in the workshop we needed to be very quiet of course, couldn’t cough, and Reinhold would try to usher the person out as quickly as possible. He kept us all those years,” Lucia said. On occasion, Reinhold and Lucia’s mother would permit Lucia to run outside through the city and the Vienna Woods. Those were the only times that Lucia felt free from the fear that governed their lives in hiding. “I didn’t have any orientation problems or fear. Strangely enough, I am a person with little fear, even today. I almost like to describe it as careless. I was afraid in the workshop when the doorbell would ring. Even today I still find it unpleasant when the doorbell rings. This is a matter of a short moment, but it has stayed with me. Otherwise I’m rather fearless,” Lucia said. 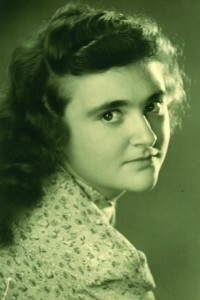 After the war, Lucia spent a year in Australia with her father but returned to Vienna. She became a physician, married Alfred Heilman, a Ukrainian Jew, and had two daughters. In recent years, Lucia has visited schools and spoken with students throughout Austria about what she went through during the Holocaust. Lucia receives monthly payments from the Claims Conference Article 2 Fund in recognition of the persecution and suffering she endured.